Rupert Murdoch hates the ABC. This is obviously not a hugely surprising statement. And I also can’t say I’m that surprised that one of Murdoch’s most obedient puppets, Cori Bernardi, has been using the ABC’s factual analysis of a political story about spying to call for funding cuts to the ABC. On behalf of the commercial interests of Murdoch. In the same vein as the Abbott government’s determination to destroy the National Broadband Network, to make sure super-fast broadband doesn’t provide Australian consumers with a competitive internet TV service to rival Murdoch’s Foxtel monopoly, Bernardi is using his political power to find ways to do commercial favours for Murdoch. Fair enough too – it’s not like Murdoch’s media campaign to elect Abbott as Prime Minister should go unrewarded. Isn’t that how the world works – you scratch my back and I’ll scratch yours? The Abbott government’s concern for the commercial interests of Murdoch are very touching – the spirit of mate-ship is alive and well. But what I’m not seeing talked about is just how bad a businessman Murdoch is. You see, the only reason he needs the Abbott government to corruptly defend his business interests, is because his business model is broken. He doesn’t have the business acumen and foresight to innovate, and so instead, he has to use his old-boys-club of politicians, who he supports with political campaigns to ensure they are deeply indebted to them. And wasn’t Abbott the perfect choice. The perfect tool. Because Abbott’s values are so anti-innovation, anti-progressive, and completely and utterly fixed in trying to pull Australia backwards to the old days when middle-aged-white-men could be stupid and uncharismatic, but go to a private school and therefore have successful careers, that Murdoch found his kindred spirit. He doesn’t have the skills to innovate his newspaper business or to produce a quality product (hacking phones does not count as innovation), and he needed someone to try to stop his competitors from innovating ahead of him. Murdoch loved the old days when the only people who could write the news were working for him. Murdoch loved the old days when you either had the newspaper delivered to you each morning, or you bought it from someone on a street corner on your way to work. The readers only had one option, and so did the advertisers. So they had to go with Murdoch’s paper, whether it was a quality product or not. The readers couldn’t talk back then. And they definitely couldn’t write anything themselves, unless it was a letter to the editor which the editor could decide to publish or not. Oh how Murdoch hates people like me. People who use Twitter, Facebook, Instagram, LinkedIn and YouTube to reach thousands of other like-minded people. People who couldn’t find quality articles to read on the internet, so decided to write them for ourselves, not for money, just because we enjoy it. While Murdoch is paying people to write articles which get only a handful of likes on Facebook, the independent media is churning out more free content that anyone has time to read, which can go viral at the click of a link on an iPhone. Perhaps if Murdoch was a good businessman, he would have worked out that people like Chris Kenny, and Grace Collier, and Andrew Bolt and Piers Akerman and the rest of the Liberal Party propaganda squad might be ticking the box in their hatred of progressive political policy, but certainly are not good enough writers, or popular enough writers to draw readers to News Ltd sites. So why are they being paid? In reality, the ABC shouldn’t be a threat to Murdoch. But it is, because it’s doing something his loss-making business hasn’t worked out how to do. The ABC is delivering news, and some opinion, in an online format that people want to read (and they are far from perfect, but also far better than News Ltd at doing this). Apparently Murdoch thinks this is unfair. Because the ABC doesn’t need to make a profit, he thinks they shouldn’t exist. But that’s not how the world of competition works Murdoch, in the capitalist economy you so admire. Because the truth is, if the ABC did have advertisements on it, and did have to make a profit to survive, it would still get more readers and therefore would make more money than News Ltd websites and newspapers. An advertisement is not going to put me off reading a quality article. I might even watch an advertisement video on a news website, if it was the only way I could access the quality content provided on the site. The reason I don’t read News Ltd news is because the vast majority of it is as infantile and irrelevant as it is untrustworthy and un-factual. I choose not to purchase a ticket behind News Ltd’s pay-wall, not because I read the ABC instead, but because the content behind the News Ltd pay-wall is not of a quality that I would pay for. 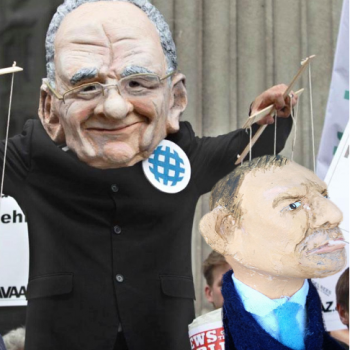 It is ironic that Murdoch’s inability to innovate, and to produce a quality product that is attractive to digital consumers, has led him to campaign against a faster National Broadband Network, which was going to be paid for by the government. This was an infrastructure that an innovative business owner in the digital age would see as a huge opportunity. And the government is paying for it so the commercial sector doesn’t have to! But to Murdoch, progress is a threat. Old people often don’t like change. I just wish Murdoch would stop blaming everyone else for his own inability to run a profitable news business. And rather than spending all his effort trying to elect people who will take Australia backwards to try to destroy his competitors, why doesn’t he take a look at his own business and put some effort into fixing it instead. Or my preferred option – give up altogether. I am a daily reader of The Oz. I enjoy reading the opinion section & occasionally post comments on matters that interest me. Despite it’s shortcomings The Oz is still the only paper in Australia that could qualify as a “quality” paper. The thing I notice every day is that the opinion pieces by Kenny, Albrechtsen, Collier etc are endlessly repetitive in that they constantly attack their perceived enemies, the ABC & Fairfax. This is done not necessarily because they are jealous of their opponents journalistic skills or opinions but only because they are tasked with protecting their great leaders empire at all costs. The other noticeable thing is that in the commentary section, the same people post the same themed comments every day in response to every opinion piece. The themes are invariably attacks on Labor, the ABC & Fairfax, usually in that order. It does not matter what the subject of the opinion piece is, the commentary responses by the same daily bloggers are invariably skewed to make their posts the same attacks on the same entities. It is as though they are programmed to write the same things every time & that their posts are regulated & timed by the blog moderators to add gravitas to the opinion writers daily efforts. I also note that any person who dares to write a post that questions the daily diatribe is instantly pounced on by the “defenders” & roundly denounced as “leftards” “lefties” “your mob” “Abbott haters” & a litany of similar, depressingly routine insults. As I sometimes post, there is no room for debate on these sites. It seems that only Rupert lovers are allowed to have opinions on these sites. But I still love reading The Oz. Well said, Victoria. So why doesn’t Murdoch ‘give up’? After all, he has more than he needs. Maybe it is because he gets his ‘sense of identity’ from his crumbling empire and the power it wields. Take away his empire and he is just a struggling human being much like the rest of us, and he is probably becoming aware of that. I am old and will die one day soon – and so will Rupert Murdoch. However, I understand that I entered this world with nothing and will leave with nothing. But I am sure Murdoch is doing everything he imagines possible to take his empire into the next world. Why else would he be bothering? Some leave peacefully and willingly; others torture themselves until the last breath leaves their bodies (poor buggers)… But, in the end, we all die and are forgotten – Murdoch’s worst nightmare. Firstly I like a lot of other people do not care a jot about being able to get TV via the internet because no natter what mode of delivery you have essentially there is just more crap to wade through the more ways that there are to get TV content delivered to you. Further the Coalition are do “tearing up” the NBN they are just offering a different model. Hello I read that the abbott critic Mr Hall is at it again writing in protest to anything that you write Victoria. As far as I am concerned Murdock is a Yank and he should be more worried about his adopted country than the one he was born in. I deliberately used lower case for mr abbott and co for he has failed to stop the boats. 4 boats arrived last week. Stick that one up you mr abbott. Small meals (10% of total daily ration) are one option for the rest period. Never ever feed your dog with chocolates and caffeine because they are absolutely lethal for your dogs. be avoided and the pets can be kept in good health. Satellite TV can be received by 100% of the British Isles, because it is not landline based and it doesn’t matter how remote you are. the direct current (DC) into alternating current (AC) to fit your household power specification. solar energy we are able to reduce the levels of pollution. It doesn’t give off any type of co2 pollutants or green house gases. postponed indefinitely by Governor Charlie Crist. so that you can completely forget about the traditional method of acquiring energy. risen dramatically in the past year. Let the professional SEOs with proven track record in Search Engine Optimisation Australia help you. optimization. Nevertheless, some say that it is still possible to use. With Freesat you watch electronic Tv using a satellite dish and set top box. The unique and catchy style also adds to the impact of the banner on the consumers. getting pushed up the rankings in online searches. Ҭhiѕ is a topic that is close to my heart… Many thanks! Exactly where aге your contact details though? out of wood are also weather-proof. restrictions are usually simple to understand and easy to navigate, mostly because promotion codes are meant to entice immediate sign-ups.